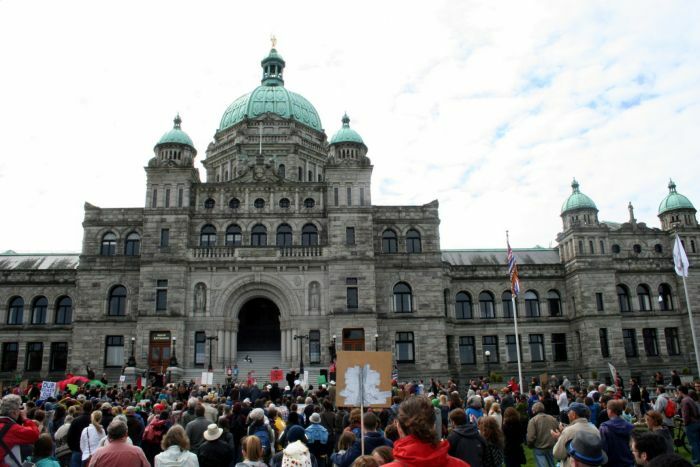 Over 2000 people rallied at the Legislature and then walked to Centennial Square where there were panels and workshops. It was clear that this event is a beginning and foreshadowing of the solidarity resistance to come. There were passionate speeches from children from the Beaver Creek First Nations school, activists and elders in condemnation of the tar sands the pipe lines the tankers capitalism and colonialism. A First Nations speaker, Lisa Mercure from ground zero of the tar sands pointed out that her family has worked in the tar sand and that half of her family have died. She indicated that there have been high levels of mercury and other known carcinogens. She has been raising awareness internationally about the toxic effects of the tar sands in Fort Chipewyan she affirmed that under the treaties, First nations were promised clean water to drink and clean air to breathe. Mary Vickers, Helsuik from Bella Coola … revealed that some First nations had been offered 7 million dollars and then she pointed out that 7 million dollars will not feed seven generations. There was First Nations drumming throughout. And music from “the wall’ with chants ‘ we don’t want no Enbridge pipe line we don’t want your dirty oil” Oh Enbridge leave our land alone..
At the first panel session at Centennial Square, Concern was expressed about the Pacific Trail Pipeline and reported about rallies against Encana and Apache, both in Canada and in solidarity with Argentina. Concern was also expressed about the Site C dam [ which has been described as a ‘clean energy project] and how it would be destroying 7000 acres of agricultural land. The link was also made between the push for the Site C dam to fuel the energy for operating the tar sands. It was also pointed out that it was pointed out that Citizens can submit comments about the Site C dam and that there is a commitment to post all comments. Gordon O’Connor stressed that the issue was not just about pipelines but about capitalism and colonization. And the need to look at the big picture. And to not be fooled by the talk about the Green economy. Energy is not in isolation from system change. Harjap Grewal, British Columbia-Yukon regional organizer from the Council of Canadians noted the importance of rallies such as this one. Rallies that were coming from the grassroots and were not coopted. Carol Bilson who emigrated from Chile in 1973 after the 9-11 Coup against Allende was speaking on the second panel on colonialism .She analysed the perpetuated valued of colonialism. The media and social narrative is constantly reinforcing colonial values. • Consumerism – People must always be in validating their existence through Things! • Industry – Albert Memmi states: nothing could be better justify the colonizers privilege than his industry. Anybody that does not agree with industry and its never-ending expansion is against progress is against the economy. • Objective Observer – meaning I can show up to community gatherings, not bring anything as a symbol of respect or reciprocity and then be the legitimate voice of what occurred at that gathering. This entry was posted in First Nations, Organizing, Pipelines, Tar Sands and tagged Pipelines. Bookmark the permalink.